FREE PRINTABLE for kids to interview grandparents! We’re making it easy with a printable for children (or grownups!) to interview their parents or grandparents. It’s just a simple ten questions that will get them talking together and learning more about their lives. In our family, we are focusing on gifts of presence rather than presents, i.e. meaningful experiences rather than “stuff.” You know, “collect memories not things.” So… we used this for our children to interview their grandparents, then as their Christmas gift last year, we held a special “Grandparent Day” to celebrate them. We planned the food and activities around their answers to the interview questions. We created a special day for each of the two sets of grandparents, separately, and had a wonderful time enjoying each other. We made new memories together as a result of recording old ones. Download the simple interview questionnaire here, then use that precious family history info however you like. You can honor grandparents with a celebration focused around all of their “favorites.” Consider recording the interview session. Make sure you preserve and share the answers with other family members. You may also consider adding it to Family Search as a memory. Gathering family history from living loved ones is a fantastic opportunity to learn about their memories while making new ones together. Win-Win!! I hope this is helpful. It was a wonderful experience for our family that we plan to build on each year. The grandparents have requested it as an annual tradition! 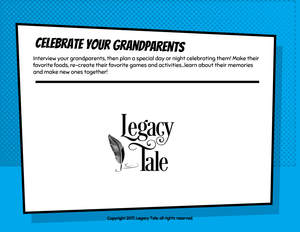 I’d love to hear how you use and share the memories you collect to honor parents and grandparents. Comment below, and feel free to share this on social media and invite your friends to use the simple interview with their family.